DeQuervain’s Syndrome is a painful condition affecting tendons where the wrist and thumb meet. 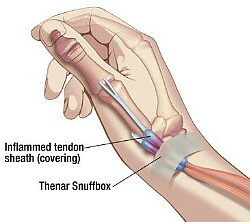 Wrist injuries in golf are fairly common and many top golfers will suffer through them, with ‘suffer’ being a key word. Unless you’ve had one, you have little idea of what that means. Proper hand and wrist action are paramount for an effective golf swing, and when either wrist is compromised, major trouble ensues. Michelle Wie’s highly chronicled injuries early in her professional career left many people skeptical when the injury seemed to flair up as she was playing poorly and then subsequently withdrew….only to show up a day or two later playing in another event. Phil Mickelson was also plagued by wrist problems, withdrawing from the 2007 Memorial after several shots resulted in visible pain radiating throughout his left arm and wrist. He said, “I don’t think it’s anything serious……I just can’t put any pressure … or grip the club.” If you can’t do those two things, there’s an issue. Tiger Woods is no stranger to wrist injuries, though he often won’t admit it. There was speculation about his left wrist in the 2013 U.S. Open at Merion and Woods’ errant shots seemed to indicate something was up, but he continued playing, despite deep and unforgiving rough, often a tough customer for hands and wrists to plow through. As an amateur playing in the 1995 U.S. Open at Shinnecock Hills, Woods did withdraw due to a wrist injury. Henrik Stinson won the PGA Tour Championship in Atlanta – and its $10 million dollar Fed-Ex Cup bonus – nursing an ailing right wrist…..certainly a fair reason to play through the pain he admitted he still had, and still a concern as he moves forward with his career. What is going on here? We see the problems but rarely is a diagnosis offered. In Wie’s case, at first nothing more than a sprain was cited. “I won’t lie,” she said, “Everything hurt. I took a lot of Motrin. I was taking four or five pills a day, and then I had to take stomach pills because of all the painkillers. I even got food allergies, probably due to the stress. I got allergic to cherries, pineapple, dairy. I got sick all the time. I was not healthy.” Wie has dealt with wrist weakness for over a decade. Not surprisingly, her wrists take a beating due to massive torque her swing generates with powerful leg, arm and hand action. However, three broken wrist bones were revealed later. Walking wounded, Michelle Wie getting therapy on-course for a wrist injury. At this moment, I am sidelined with a wrist problem diagnosed as DeQuervain’s Syndrome, a probable cause for many golfers’ wrist injuries. As mentioned earlier, unless you have experienced this agonizing condition, you cannot comprehend the pain. Doctors aren’t quite sure what causes it, though swelling and hormonal changes in both men and women are probable culprits. But here it is: imagine someone driving a knife deep into the soft part of your wrist if you happen to turn it the wrong way, which can be anything from opening a jar, to picking up a book, to manipulating your mouse or typing on a computer, to turning your car’s steering wheel, to….doing nothing. Sadly, there is little over-the-counter relief. Michelle Wie mentioned gobbling up Motrin, but it really doesn’t help the pain – or your golf game. This is my third go-round with the condition, which does affect women more so than men. In 2007, I played in a media day for the 2008 PGA Championship at Oakland Hills. The fairways were narrow, the rough deep, and the next day, my left wrist was sore despite no visibly catastrophic incident like Phil’s or Tiger’s during tournament competition. I sought no help thinking the condition would pass – as any previous injury usually had. I was wrong. Five days later I was on a plane to Wales to play links layouts in the Cardiff area including a preview of Celtic Manor’s Ryder Cup course, or the Twentyten, as it is now known. Throughout the whole trip on magnificent seaside courses, I could not bend my wrist and had to throw the ball out of any of those marvelous bunkers I happened to find. I wore a brace, gobbled up Ibuprofen, drank Pimm’s, swung straight-armed at half-power, and could not imagine having to play in a tournament. When I returned home, I tried to heal the injury naturally, but the effort was futile. Finally I sought out Michigan orthopedic surgeon Dr. Steven Heithoff, who explained the condition as DeQuervain’s Syndrome. Rejecting the cortisone injection he offered, the pain wore on for weeks afterwards. I finally succumbed to the shot and relief was instant. Mickelson, comforted by Japanese Shiatsu massage from trainer Jim Weathers. to grasp or grip things, like Phil had, you likely have the condition. Onset can be sudden or it can develop over time; it can also develop along with the onset of inflammatory arthritis, with which Mickelson was later diagnosed. Rest, therapy, thumb and wrist splints can help, but if the condition does not improve, a cortisone injection or surgery may be necessary. For me, the left wrist injury never came back. However, in early July of 2013, the right wrist became sore in the same manner. I wasted no time in scheduling a doctor’s appointment. There were golf story assignments: Treetops Ladies Golf School, the Gaylord Golf Mecca, a special media version of the regular Treetops Golf School with Golf Digest top instructors Rick Smith and Jason Guss, and a Sweet Home Alabama sojourn in early October to explore Alabama’s gulf coast, the Mobile area, and Robert Trent Jones Golf Trail courses. Relief was again instant and all was well….until mid-October, when suddenly, the right wrist flared up again. I sat in excruciating pain for five days until my doctor returned from vacation this week. Another injection later, the wrist is still aching but that’s likely due to inflammation building as the injury went untreated. It will take a few days for inflammation to decrease. In less than ten days I head to southwest Louisiana to check out some courses there so I am heartily rooting for the cortisone to do its healing magic. At the moment, I can barely fathom gripping a golf club, but the thought of impact makes me cringe. If you have been spared wrist injuries, give thanks. Furthermore, please also refrain from criticizing any golfer – tour player or otherwise – for using a wrist injury as an excuse for poor play or for withdrawing from any event. Until you’ve been there, you have no clue what it is like to know that every good swing will hurt, every impact will sting, and a bad swing will……..let’s not go there. And why golfers won’t admit it when an injury is present? Because we don’t like to make excuses. Look how long it has taken me to discuss the first injury: 6 years. Why now? Perhaps my experiences will help other golfers understand what is happening and to seek help. And really, the game does not need to lose any more golfers, especially to something that can likely be fixed.